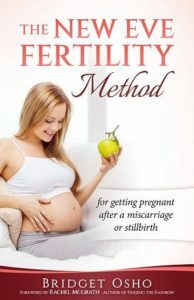 I recently had the privilege to read Bridget Osho’s New Eve Fertility Method prior to it’s release. Bridget is a strong advocate for women who have experienced the loss of miscarriage and stillbirth to channel the strength of their body and mind to conquer their infertility. Even more amazing, Bridget asked me to write the foreword for her new release. Bridget doesn’t give you a miracle cure, but she does offer some truly valuable insights and advice to support women experiencing obstacles on their pregnancy journey. The New Eve Fertility Method is available now on Amazon. I understand how frustrating it can be when your body is fighting against your need to become a mother. I never expected that having a healthy baby would be so heart-wrenchingly difficult. In fact, like many women; I had organised the timing of getting pregnant to fit around my lifestyle, fully anticipating that motherhood would fit into my well-planned future. Well I was mistaken. Over a five-year period, I fell pregnant five times. The first four resulted in the heart-breaking loss of miscarriage. For a long time, we had no answers and I went through a tirade of emotions – grief, frustration, anger, jealousy, fear, pain and many more. I questioned everything I was doing and all of our decisions around starting a family. As a female we are designed to procreate, and yet my body was failing me. My age was the overriding factor, but much of the diagnosis around my infertility also remained an unknown. I longed to become a mother, and as time progressed I became obsessed with ovulation, testing, timing and any tactics that could quickly increase my chances of a successful pregnancy. I soon learned, that we cannot control this process it was important to first understand myself, and my body. We were fortunate; after trying for so long, and wishing very hard, we fell pregnant, naturally, and we were blessed with a beautiful baby rainbow boy. Through all of the obstacles we faced, I had always remained hopeful. I was determined to reach my rainbow, become a mother and conquer my infertility. Through everything, my relationship with my husband was paramount, and more than that, I had to believe in myself, defining my own strength to keep fighting and never giving up. Whilst every woman’s story is different, and not everything in life is clearly defined, I truly believe in the power and strength of belief and hope. Whist sometimes infertility feels a isolating and lonely place, we are not alone on this journey. If anything, this experience has made me stronger. I am eternally grateful and feel blessed to finally have my rainbow baby. Bridget Osho’s, The New Eve Fertility Method an insightful, supportive and powerful read for any woman who is struggling with their infertility. The power of the body and the mind should never be underestimated, and Bridget speaks with knowledge, understanding and empathy. In this book, her guidance is focused purely on the factors we can control, harnessing the power of Mother Nature and understanding your body and its basic needs. I truly wish every woman who wants to be a mother the blessing of motherhood. Believe in yourself, stay ever hopeful and remain strong for yourself and your future family.